Michael Moore: "I'm Mainstream Now"
Michael Moore showed up to his Sicko press conference in New York City Tuesday to talk about the healthcare system, but, just a few questions in, found himself discussing the issues of online piracy instead. Last week, his new documentary found its way online, spurring his distributor to bump up the film's release to this weekend, opening on one screen in Manhattan and scheduling sneak previews in 27 markets. Moore was ready for the piracy questions. "Let's talk about that," he said, sporting his trademark hat, jeans and sport coat. "The film that leaked on the Internet is not taken in a movie theater with a home video camera, the way its usually done. This is an inside job. Now, if you were a police detective, what's the motive? Who has a vested interest in destroying the opening of the film? Of ruining the opening weekend box office?" By those parameters, a conspiracy to sabotage Sicko could involve anyone from the head of Pfizer to the folks behind Pixar's Ratatouille, which opens on June 29, when Sicko is scheduled to open nationwide. Moore encouraged the gathered press to start making calls on the issue, and then added, with a conspiratorial smile: "Having said that, I'm glad people were able to see my movie. I'm not a big believer in our copyright laws, I find them way too restrictive." He said he hoped people realized that he was no longer a radical bomb-thrower but was now firmly in the American mainstream. 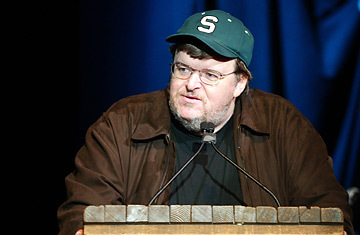 "Three years ago I was booed off the Oscar for daring to suggest that we were being led to war for fictitious reasons," Moore said, recalling the night in 2003 when he accepted the Oscar for his documentary Bowling For Columbine and made headlines with an anti-war outburst that ended with the proclamation "Shame on you! Shame on you!" directed at President Bush. Moore said that today "70% of the country agrees with [that sentiment]. They don't support Bush or the war. I am now in the mainstream majority, which is weird; I don't sit out on the edge, I sit here." Moore ticked off each of his films, and recounted the ways he believes the world has caught up with his sentiments. With 1998's Roger & Me, he took on General Motors and no one listened, Moore said. Today, "they're near bankruptcy." With 2002's Bowling For Columbine, he tried to take on the culture of gun violence, and this year there was another deadly school shooting at Virginia Tech. With 2004's Fahrenheit 9/11, he took on a then-popular president and a then-popular war, and he said Bush's polls have plummeted ever since. He went on about how real life seemed to be following his art. "It's the story of my life as a filmmaker. I went to Walter Reed hospital three years ago; the mainstream media didn't deal with it until just a few months ago... They came around to [realize] what I was saying on that Oscar stage, in Fahrenheit 9/11, was correct." With Sicko, a movie that does not take aim at the gun lobby or the Republican party, but America's healthcare system, Moore believes he's chosen less hostile territory. It's a topic that "both conservatives and liberals" can identify with, Moore said. But he says that he will be denounced no matter what he does: "Those few remaining voices in support of the war and in support of Mr. bush would criticize me if I opened up a factory making American flags. If I gave away 1,000 American flags every day they would find some way to go after me." Moore dismissed the controversy surround his visit to Cuba with a group of 9/11 responders seeking medical treatment, documented in his new film. He said he had not intended to go to Cuba in the first place. "I didn't go to Cuba. We left Miami to go to Guantanamo Bay  to American soil." Only after being ignored at the mouth of Guantanamo Bay did he instead dock and disembark on Cuban soil. Since then, he says, he has been harassed by the U.S. government. "The Bush Administration sent me a certified letter 10 days before the Cannes Film Festival that I was under investigation for criminal and civil penalties," Moore said. Travel to Cuba is illegal, with a few exceptions. Journalists, for example, are allowed to travel to the communist state to report a story. Moore thundered: "The documentary is a work of journalism; no laws are broken, it's just an attempt by the Bush Administration to use our federal agencies as they've been known to do in the past to politically harass opponents." Just goes to show, you can lead a radical into the mainstream but you can't keep him quiet.